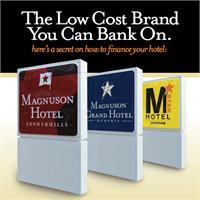 As the company nears its 100th branded North American hotel, Magnuson Hotels reports nearly 3/4 of a Billion Dollars in bank loans have been made to hotels carrying the Magnuson low cost brands. Recent ads comparing hotel brand marketing fees of Magnuson against major franchise chains have resulted in 40 new brand conversions, including switchovers from Choice Hotels, Wyndham, Intercontinental, Best Western and Carlson Hotels. Magnuson Hotels’ brands include the midscale Magnuson Hotels, the upscale Magnuson Grand Hotels, and the economy M Star Hotels. Magnuson Worldwide, headquartered in London UK and Spokane, WA is the world’s largest hotel services organisation. Magnuson Worldwide’s holdings include Global Hotel Exchange, GDS1, PMS1, Magnuson Hotels, and Magnuson Marketplace.